Update:: Belmont is closed. 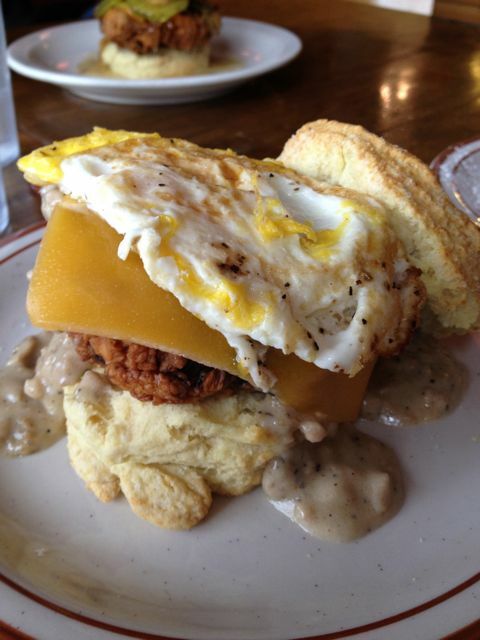 Now Pine State Biscuits is located on SE Division and also on NE Alberta. If you are a lover of this place, then I apologize up front. This is not my kind of place. But in all fairness I will give you all the great details. Pine State Biscuits is a very, very, very small building with limited seating. We just so happen to show up late on a Monday morning and we were able to snag a seat. From reading reviews and recommendations we order the Reggie Deluxe. This was fried chicken on a biscuit with gravy, cheese and a fried egg. My husband got the McIsley, which had the fried chicken on a biscuit topped with pickles, mustard and honey.Even though I ordered the Reggie, I ended up switching with my husband. We both agreed we liked each others better. The meal was incredibly heavy. Fried chicken, gravy… you get the idea. We just don’t eat like that, so it hit both of us pretty hard. I thought the combo was good, but I didn’t think it was out of this world. For a biscuit place I was expecting a much better biscuit. Want a good biscuit? Go to Bob’s Red Mill or Fat Milo’s in Sherwood. Unfortunately we won’t be back, but that’s ok, it will make extra seats for those of you that love this place. Atmosphere was tight and cozy. A little on the dingy side. You bused your own tables and no one was wiping them down in between patrons. Pricing was ok. It cost us $18.50 for the 2 of us with our drinks. They served Firfox tea, which was really good. They also have free refills of Stumptown coffee. You order and sit down, and grab your own drinks, so there was no service. The counter was helpful in making suggestions. 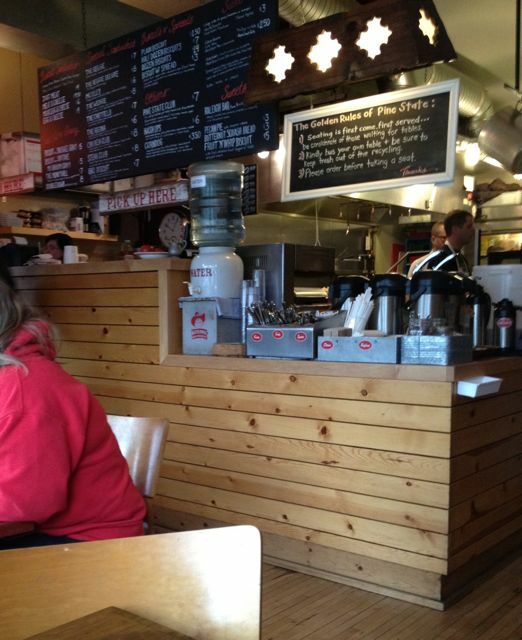 Pine State Biscuits in located in the Belmont District. Have you discovered any good pie places yet? I will coming out to the NW probably the summer of 2013 so you have some time. It isn’t a problem to have a heavy meal like that. You just need to plan for a nap afterwards and sleep it off. I had no idea Bob’s Red Mill had a restaurant. I buy his stuff all the time. I can take you by it when you come visit next. Fun place to shop and eat. You are so taking me to this place next time I am in town. I am a biscuit connisseur (sp) and am perpetually on the hunt for a good biscuit.